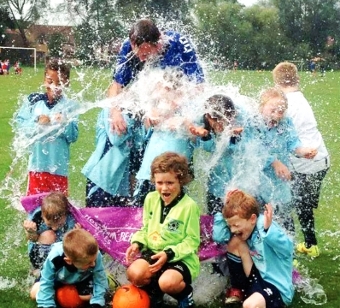 THE new season has started with a splash down at Goldsworth Park Rangers this year. The local youth football club have their biggest ever number of teams and members this season, with 22 squads from under-seven to U15 taking to the pitch, including two teams just for the girls. Having being established in 1983 the club has grown more and more popular over the years, with last season seeing them at their most successful; winning two league titles, savouring two cup wins plus a cup runners-up spot across their various age groups. Among those raring to go this month are the Griffin family, who were suited and booted for last weekend’s early fixtures. Goldsworth Park Rangers Chairman, Lee Swain, said: “It is great to be able to add more new teams to the club this season. The club started training last weekend, with league fixtures starting next week. Training certainly started well for one young team, with the U8 T-Rexs being inspired by the recent Ice Bucket Challenge craze. The team are pictured here after volunteering to get soaked while raising money for Woking Hospice, with the children donating £25 between them. And the fun doesn’t stop there at GPR. They have a thriving youth development section for U6s, aimed at children in Year 1 or Reception at school, or younger. The kids take part in fun football sessions every Saturday morning at Goldsworth Park Rec, from 10am to 11am, with all new players welcome. The sessions cost just £2 a week and are an ideal introduction to the beautiful game. Any new players are welcome to just turn up, or to find out more details just email chairman@gprfc.org. THE club have also announced the launch of a new girls team. Goldsworth Park are now actively recruiting to start a new U10 team, as well as bolster their U12 and U14 teams. Any school Year 4 or 5 girls wanting to play in a team should send an email to chairman@gprfc.org.